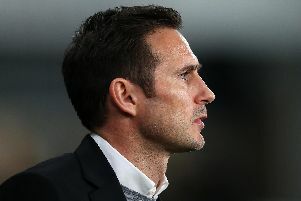 Disappointed Derby County boss Gary Rowett said poor mistakes were to blame as the Rams’ stuttering promotion challenge continued with a 2-1 defeat to promotion rivals Fulham. The Londoners’ first win at Pride Park since 2002 saw them climb above Derby to fourth place. It left the Rams in fifth, seven points off the automatic promotion plaves and five clear of seventh-placed Middlesbrough. Despite another frustrating afternoon for County, manager Rowett praised the quality that Fulham showed, but was disappointed with the way his side conceded. “They are a really good side and I can accept it, but we have made two very poor mistakes for the goals,” he said. “We should never concede to Fulham from a corner. Two first-half goals for Fulham were enough to clinch another win over a fellow play-off side . Derby pulled one back with just over 20 minutes to play through Tom Huddlestone. A poor free kick from the right-hand side fell to the midfielder, whose weak shot somehow found its way past Marcus Bettinelli. The Rams had late chances to salvage a point as Cameron Jerome and Richard Keogh went close, but defeat meant they had claimed just 12 10 matches. Frustrated Rowett added: “We started as well as we have in recent matches. Things might have been different for the Rams, however as the league’s top goalscorer, Matej Vyrda, had the ball in the Fulham net from an Andre Wisdom low cross. However, the goal was flagged offside by the linesman. The opener came for the visitors through on-loan striker Alexander Mitrovic. A well-worked corner routine found Stefan Johansen on the edge of the box and, after he floated the ball back into the danger area, it fell at the Serbian’s feet, whose deflected effort wrong-footed Scott Carson. It was Mitrovic’s second goal in three games for Fulham since joining from Newcastle in January, after also netting against leaders Wolves. Twelve minutes later Fulham doubled their advantage. Once again there was a clever assist from Johansen as he found the on-rushing Ryan Sessegnon, whose shot across Scott Carson was destined for the bottom corner. It was Sessegnon’s 14th goal of the season and capped a fine week for the rising star, who was named young footballer of the year at the London Football Awards two days earlier. The two goalscorers continued to combine well and just after the break Mitrovic almost added a third, but was off target. The introduction of loanee Kasey Palmer seemed to spark new life into the home side, they pulled a goal back but were unable to get a second to earn a point. Rowett said: “We had a goal disallowed for offside and then made a stupid mistake. “You don’t expect Fulham to score against us from a corner. “We are making some poor decisions.